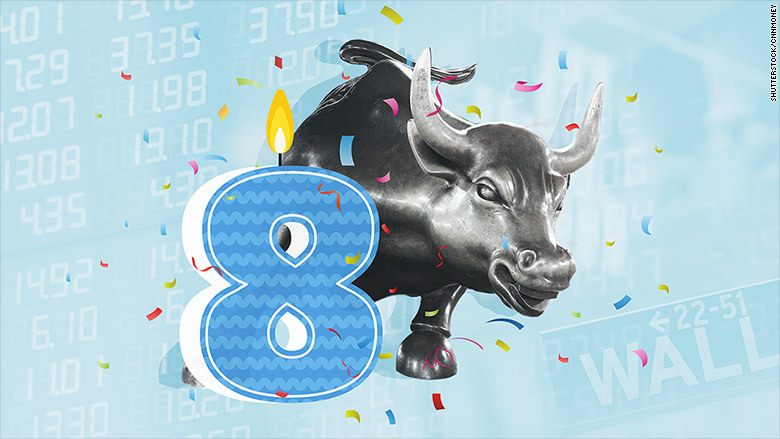 The bull market in stocks is celebrating its eighth birthday in style. It comes amid a series of market milestones following President Trump's election. The Dow blew past the 20,000 threshold in late January and then climbed above 21,000 just a month later. All told, the bull market in stocks has lifted the Dow an incredible 14,300 points, while the S&P 500 has more than tripled (249% to be exact). The best part is that regular Americans are partaking of this latest run up by buying stocks. This is in sharp contrast to earlier years, when mom-and-pop investors barely benefited during most of the market upswing that began in March 2009 during the Great Recession. "The mood today versus eight years ago is quite dramatic. It's polar-opposite. Back then, nobody wanted to buy stocks," said Joe Quinlan, chief investment strategist at U.S. Trust. Today's market is on fire, if not too hot. Hopes for "massive" tax cuts and steady economic growth have lifted stocks to new heights. CNNMoney's Fear & Greed Index even recently tipped into "extreme greed" mode before returning to simply "greed." Trump has repeatedly bragged about the market's gains and even mentioned it in his big speech to Congress last month. Individual investors, many of whom sat out much of the bull market, are feeling more confident these days. Global equity ETFs, which are looked at as a proxy for retail investors, have witnessed a stunning $91.5 billion of inflows so far this year, according to Bank of America Merrill Lynch. Investors poured $8 billion into the popular SPDR S&P 500 ETF the day after Trump's speech alone. That was the biggest burst of buying since December 2014, State Street Global Investors said. "You are starting to see the return of the retail investor, but nothing that suggests we're near a peak," said Quinlan. Related: Will Trump cheer or jeer if Fed raises rates? But could Americans be getting into the market too late? 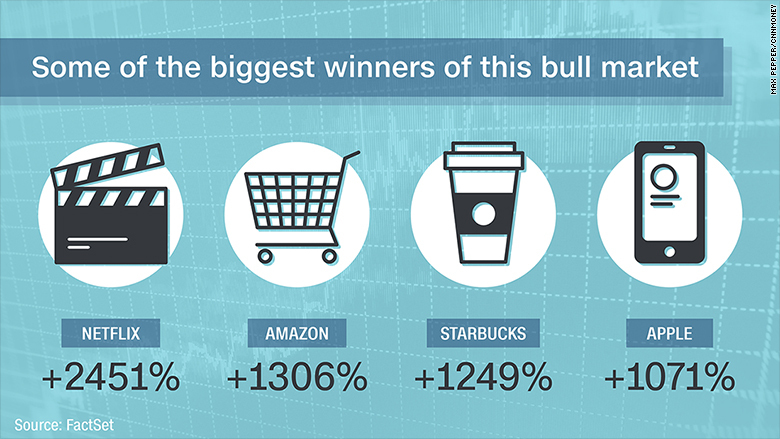 After all, this bull market in stocks is the second-oldest in history. "Bull markets don't die of old age, they die of fright," Sam Stovall, chief investment strategist at CFRA Research, wrote in a report. But there are reasons investors could face the specter of fright once again. For instance, stocks have become a lot more expensive in recent months. Since the Trump rally has been mostly fueled by hopes of tax cuts and other policy changes, not improving fundamentals, valuations have climbed uncomfortably high. The S&P 500 is trading at 17.9 times projected earnings, the richest multiple since 2004, according to FactSet. "Something needs to change. There's no question about that," said JJ Kinahan, chief market strategist at TD Ameritrade. Another way to look at the market makes it look even more expensive. Stovall said the S&P 500 is trading at 25 times trailing 12-month earnings. That's makes this the second-most expensive bull market, second only to when the tech bubble burst in early 2000. 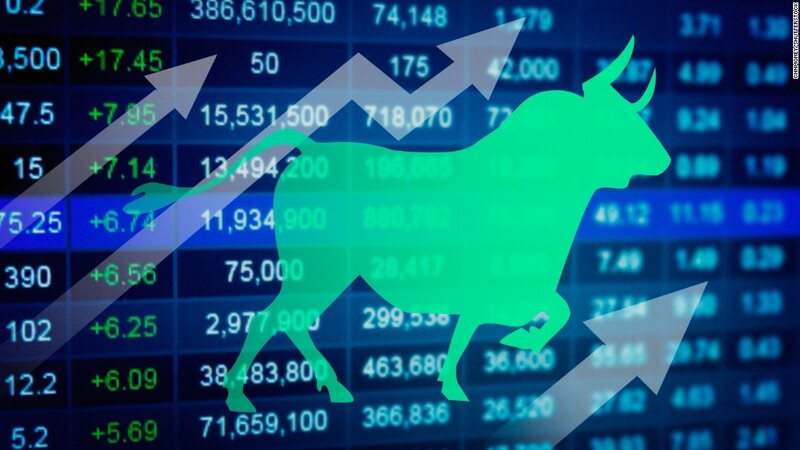 "Investors should now be on the lookout for a FOMO (fear of missing out) mindset that could signal overconfidence and sound the final lap of this bull market," Stovall wrote. Even Carl Icahn, one of Trump's earliest supporters on Wall Street, is getting cautious about the Trump rally. "I am concerned at this point that the market has run ahead of itself," Icahn told CNNMoney in a phone interview this week. Clearly, the enormous post-election rally raises the bar for Trump to deliver the "massive" tax cuts he's promised. Investors have put a lot of faith that Trump and his team will be able to pull off tax cuts in speedy fashion. That's despite the fact that Obamacare is being tackled first, and that's proving to be very complicated. "It's becoming more difficult to see how we could get through this year without a pullback in markets given that we haven't seen tax reform or a stimulus package delivered yet," said Shannon Saccocia, head of asset allocation and portfolio strategy at Boston Private. Kinahan said there's "so much optimism" about Trump's promised tax cuts that it "could be the thing that unwinds things." Even if Trump delivers, the market could retreat as investors "sell the news." 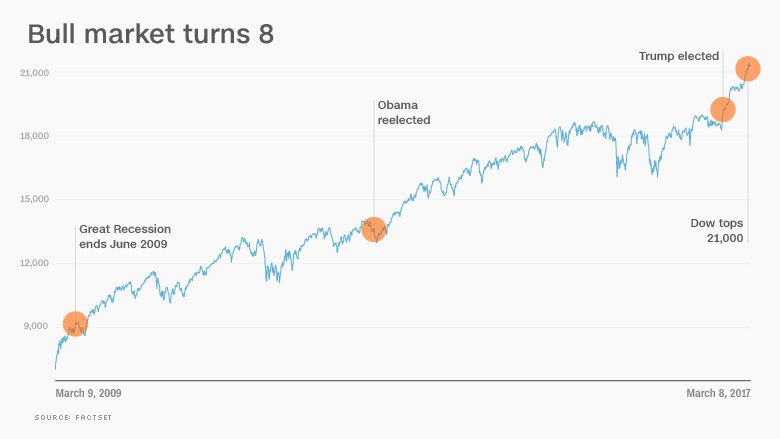 So will the bull market live to celebrate its ninth birthday? Much will depend on whether market valuations move back into reasonable levels, thanks to improved corporate profits and potential tax cuts. As always, there's the risk of an unforeseen market or geopolitical event like a clash with North Korea that derails stocks. Still, most experts are predicting the bull market will still be alive and kicking come March 2018. "Despite its age and rich valuation," Stovall wrote, "this bull market does not appear to us to be ready to throw in the towel."